Happy Wednesday Dare 2B Artzy fans! Hope everyone’s having a wonderful day. It’s finally snowing here in Colorado which is perfect for the holiday spirit, but it brings with it the bitter artic cold which isn’t so fun. Just in time for our wintery weather I have this adorable card to share with you from the Dare 2B Artzy Snowman stamp set. I just love this cute little snowman. With the set you get everything you need to create a snowman or you can opt to use just the head and scarf on a gift tag which would also be very cute. This set is so versatile. For my snowman I first stamped the circle sentiment with all of the words in it with some Versamark embossing ink and used some really gorgeous blue embossing powder that’s sort of an iridescent blue-purple. I just love this color. Once the circle stamp was heat embossed I placed cardstock with it back into my MISTI and proceeded to position and stamp the head and the arms and the little dangling star he’s holding. Once everything was stamped, I needed to fussy cut the snowman out. To make sure my circle for his body looked like a circle and not too wonky, I sorted through my circle dies and used one that was just slightly bigger than the sentiment and held it in place while I drew a faint pencil line for me to cut along. Once the snowman was complete cut out, I was able to color in the little carrot nose and the trim on his hat. Even though he’s a snowman, I gave him a really light blue outline to one side of his face with my B0000 Copic marker. That gives his face a little depth and helps to keep him for looking so two dimensional. I also added some Wink of Stella shimmer to the star. Next, I stamped just the scarf with some Versamark and I heat set it with some sparkly embossing powder called Clear Gold that actually has glitter in it so it also gives a bit of texture to the scarf. I really liked how it turned out. For my background, I used a horizontal snow drifts die from MFT. I started out first by die cutting a piece of white cardstock and then I die cut the Dare 2B Artzy snowflake cardstock from the Winter Plaid Cardstock set. I arranged the pieces like a puzzle back into place to create a snowy background and glued them in place on some dark blue shimmer cardstock. I added that to my card base of an off-white shimmery cardstock. I die cut a cute little scalloped circle tag that I had and stamped it with the Let it Snow sentiment from the Dare 2B Artzy Penguin Fun stamp set. I added a tiny white brad to the tag and placed it on my card front with a bit of dimensional foam. I also used some dimensional foam on my snowman to pop him off the card as well. Finally I’d picked up some snowflake accent pieces so I added a few of those to the front of the card as well to give it some more dimension. I think this card turned out so stinkin’ cute! I really love this little snowman all dressed up and ready for Christmas and a snowy day. As a side note, I did discover that if you happen to have picked up one of the Dare 2B Artzy Let it Snow stamp sets the snowman head from that set will also work perfectly on the body of the Snowman set that I used to create my card. That stamp set is retired, but they are still listed for sale in the store so there may be a few available still if you’re interested in picking up both, I’d get it now. 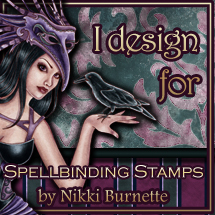 I hope you’ve enjoyed my card today and that you’ll check out the Dare 2B Artzy store to see all of the awesome seasonal stamps (many of them are new). Now is a good time to pick up some stamps and paper to give to someone for the holidays – we all have that one crafty friend (or that person might be you). Go ahead and pick up something fun that will have you being Artzy all year long! Stay tuned, next week we have a fun Holiday blog hop planned with the Dare 2B Artzy Design Team. You won’t want to miss out (HINT-HINT lots of holiday inspiration and a prize is up for grabs!! ).